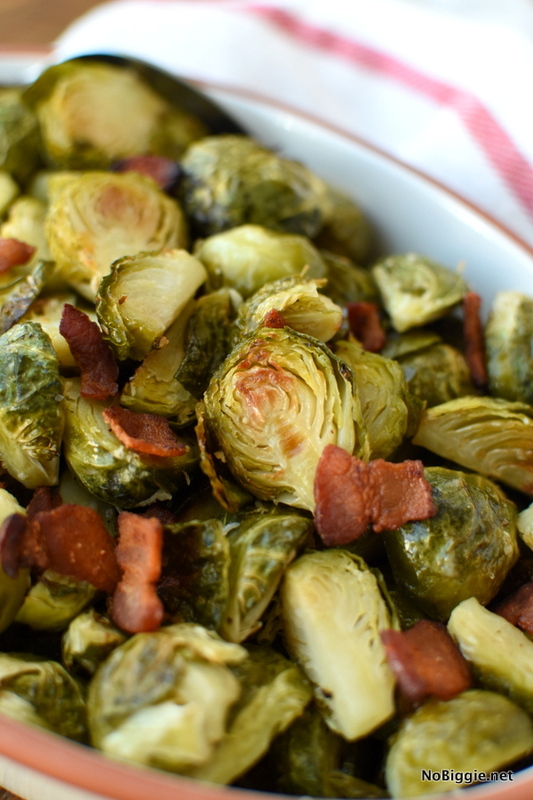 Roasted Brussels Sprouts with bacon…and parmesan cheese with a drizzle of warm bacon honey dijon sauce. 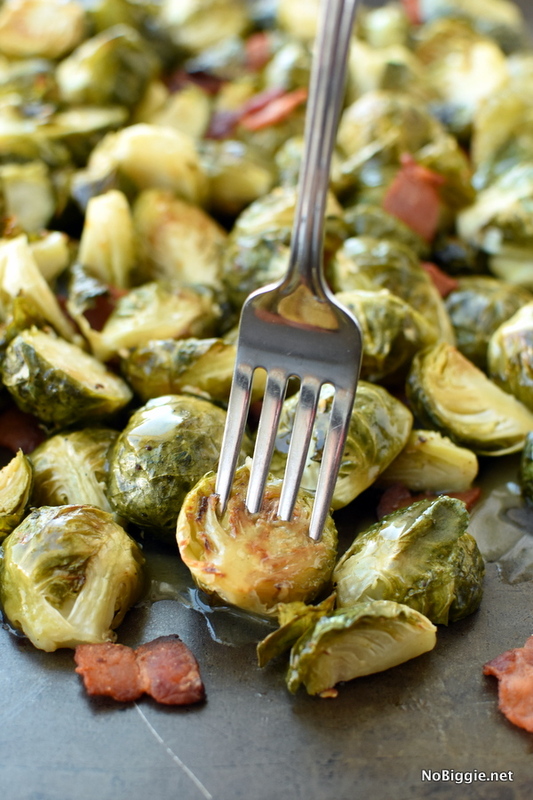 These Brussels Sprouts are the best we’ve ever had! You either love Brussels Sprouts, or you hate them. If you hate them, I think it’s because you’ve never roasted them. Roasting them brings out the best flavor. They are like crispy candy when roasted…salty crispy perfection. We are taking them to the next level with this version adding bacon, parmesan cheese and tossing them with a warm bacon honey dijon sauce. In a high heat oven set to 425, you will roast the Brussels Sprouts for 20-30 minutes until they show a few sides browned and some leaves are crispy. 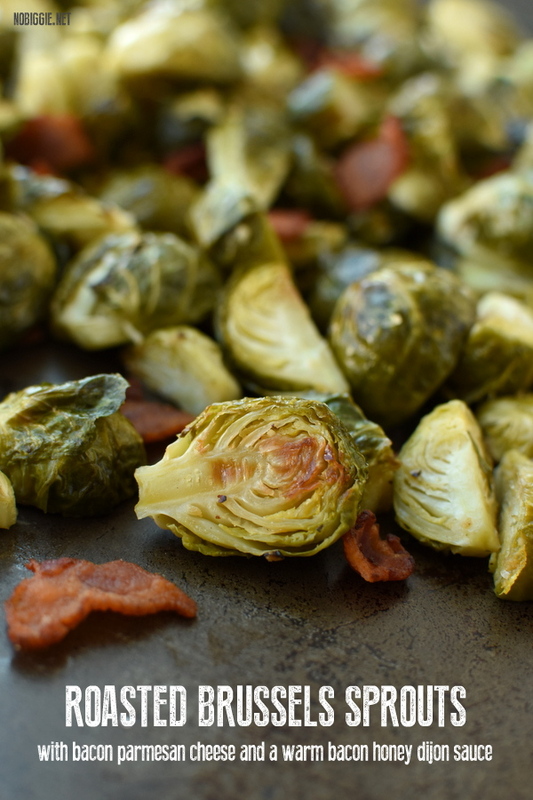 Roasting Brussels Sprouts brings out the best flavor. When they are generously seasoned with salt, pepper and tossed in olive oil before roasting in the oven, they are perfect right out of the oven. Enjoy them warm. Can you make Roasted Brussels Sprouts ahead? YES! 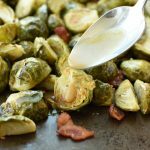 If you need the oven space for a big holiday like Thanksgiving or Christmas, roast the Brussels Sprouts a day in advance and then just warm them in a skillet on your cook top. If Brussels Sprouts are on sale and you want to stock up, you can freeze them. They are not my first choice for vegetables to freeze, but you can freeze them. You just need to trim the ends and cut in half. Then you will blanch them first, which is boiling them for 4 minutes just until they turn a vibrant green color. After 4 minutes move them to a bowl of ice water to stop the cooking process. Move them to a sheet pan lined with paper towels to allow them to dry. Move the sheet pan into the freezer. Let them flash freeze individually about 30 minutes before moving them into a gallon sized storage bag. They will store up to 10 months in your freeze. When ready to serve, do not thaw them because they will become soft and mushy. From the freezer you can roast them or pan sear them. Make sure to preheat your oven. The high temperature of 425F is key for roasting. Make sure to trim the ends and cut all the Brussels Sprouts in half. Cook the strips of bacon on the stove top to make sure it’s the perfect crispiness. If you feel like they need more or less time in the oven, do what you think is best. 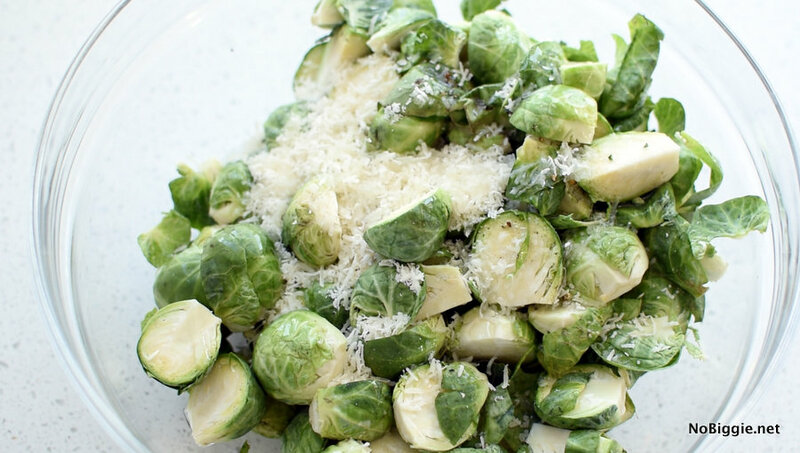 Toss prepared Brussels Sprouts with Parmesan cheese, salt, pepper and oil. Toss until well coated in the oil. Spread out onto a tinfoil lined sheet pan (the foil is for easy cleanup). Roast for 20 minutes. Take out to flip over and then move back into the oven for another 10 minutes or so until you start to see some crispy pieces. Do not let them burn. While the Brussels Sprouts are roasting in the oven make the sauce. In the pan where you cooked the bacon. Remove and drain all bacon fat out into a glass jar. Spoon in two tablespoons bacon fat, back into the pan. Turn the heat back on under the pan to medium high. Add the honey and dijon mustard and stir until the sauce is well combined. 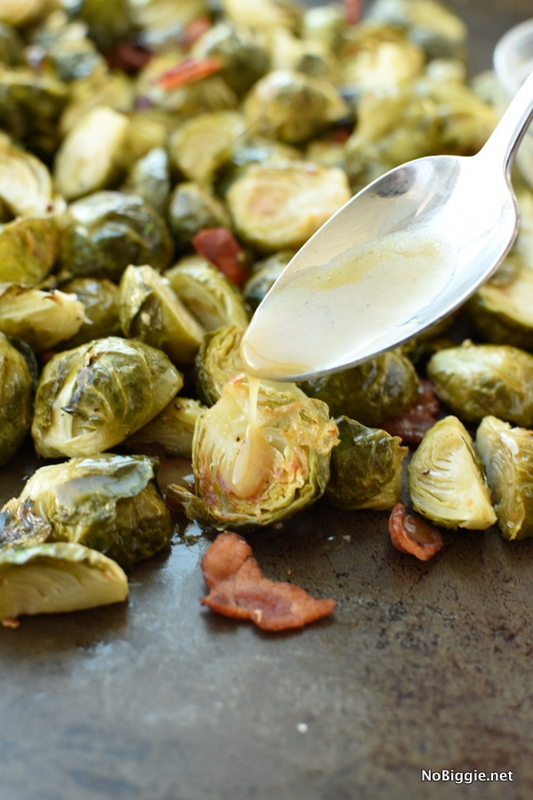 Toss Brussels Sprouts with bacon and drizzle with the warm bacon honey dijon sauce. 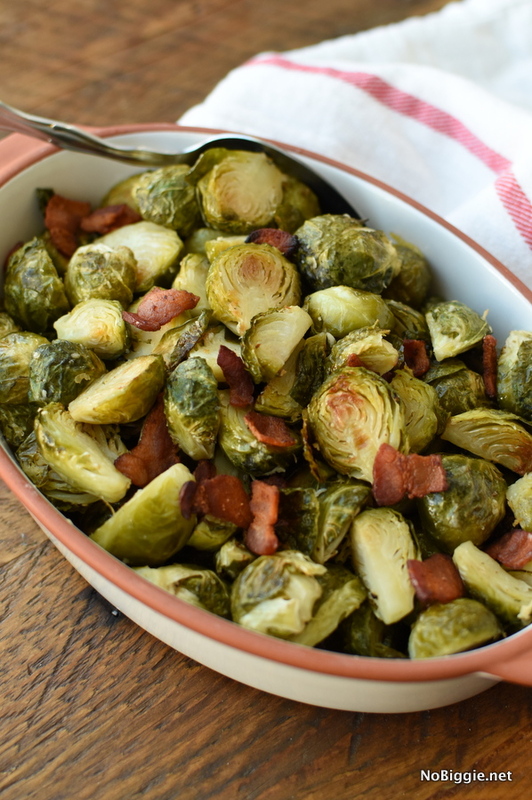 Do you love Brussels Sprouts too? They are so good roasted!